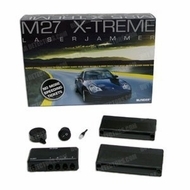 The Blinder M27 laser jammer supercedes the previous M25 laser jammer to improve laser detection and jamming performance; while adding a NEW Parking assistance mode at the flick of a switch. Parking in a public parking lot or in your garage, the Blinder M27 will alert you to an object in front of your vehicle from 1-3 feet distance. Blinder M27 Laser Jammer will provide even better results based on Speed Measurement Labs tests in June 2009. Results are reduced noise alerts and detection of all laser guns used today around the world, and even better laser jamming. Laser jammers tested by 1stRadarDetectors and Speed Measurement Labs show the Laser Blinder M27 setup as best in test since 1999. SML and 1stRadarDetectors both certify the laser blinder to prevent laser gun speed detection from maximum distance of the laser gun to the laser gun, such as Stalker LZ-1, LTI Ultralyte LR200, Laser Atlanta, Kustom Pro III, Riegl, Leveg laser guns.